Reginald Frederick Larcombe was born in 1892 at Weymouth, Dorset, and was baptised on 15 September 1889 at Melcombe Regis. Reginald was the son of grocer Frederick 'Fred' Larcombe (1864-1946) and Annie Maude née Cawsey (1864-1924). Fred and Annie had four sons; William George Edgar (1887-1949), Charles Percy (1890-1917), Reginald and Francis James Oliver (1895-1966). Their first son, William, was born in Yeovil but the other three boys were born in Weymouth. 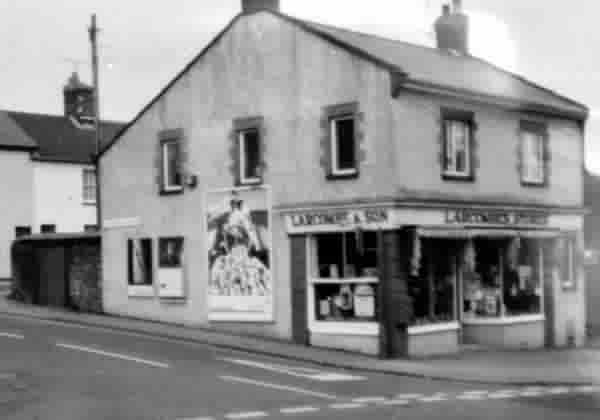 By 1900 the family had moved back to Yeovil and were living at 4 Great Western Terrace and presumably at this time Fred had his grocery shop in Sherborne Road on the corner of St Michael's Avenue - which would by known as Larcombe's Corner for generations. By the time of the 1911 census the family were living above the shop at 153 Sherborne Road. Fred gave his occupation as a grocer and both Charlie and Francis were listed as grocer's assistants, but 19-year old Reginald was working as a law clerk. We don't know when or where Reginald enlisted, but he joined the City of London Yeomanry (Rough Riders) rising to the rank of 2nd Lieutenant. His Service Number is unknown. At some point during the war Reginald was attached to the 2nd/2nd Battalion, Royal Fusiliers (City of London Regiment). The 2nd Battalion, Royal Fusiliers (City of London Regiment) were in Calcutta, India when war broke out in August 1914. As soon as a territorial unit arrived to take over the garrison, they departed for England, arriving in December and joining 86th Brigade, 29th Division at Nuneaton. They were training for France when orders arrived to prepare to depart for Gallipoli. They embarked from Avonmouth between 16 and 22 March 1915 sailing via Malta to Alexandria then on to Mudros in April. They landed at Cape Helles, Gallipoli on 25 April 1915 and were involved in heavy fighting until the evacuation on the nights of the 7 and 8 January 1916 when they returned to Egypt. In March they were sent to France, sailing to Marseilles and travelling by train to concentrate in the area east of Pont Remy by the end of March. In July they went into action in the Battles of the Somme. In 1917 they were in action in the The First, Second and Third Battle of the Scarpe during the Arras Offensive, then moved to Flanders and fought in the The Battle of Langemarck, The Battle of Broodseinde and The Battle of Poelcapelle. Before moving south for The Battle of Cambrai. In 1918 they were in action in The Battle of Estaires, at Messines and The Battle of Hazebrouck including the defence of Nieppe Forest and The Battle of Bailleul. They were involved in The Action of Outtersteene Ridge, The capture of Ploegsteert and Hill 63 during the Advance in Flanders. We cannot be sure in which of these actions Reginald was involved, but he was reported missing, killed in action, on 10 September 1918. He was 26 years old. The Western Gazette, in its edition of 20 September 1918, wrote "Mr and Mrs F Larcombe, of Sherborne Road, have received an official notification, that their son, Second Lieut. 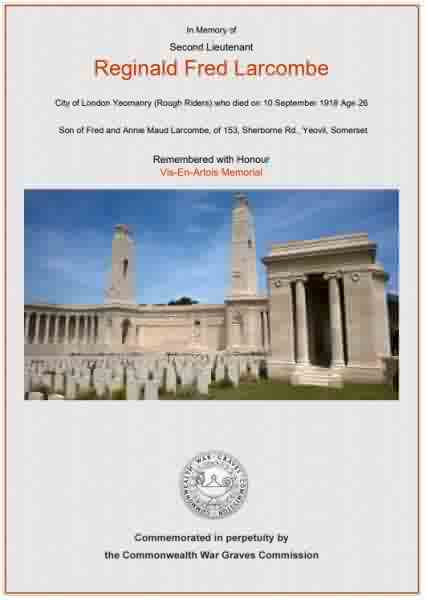 RF Larcombe, of the City of London Yeomanry, is reported missing since September 10th whilst serving in France. It will be remembered that about 18 months ago, another son, Charlie, of the Canadians, was killed in France, and about three weeks ago, Bombadier FJ Larcombe, R.G.A., was wounded, and is now home from hospital for a few days special furlough." Reginald Fred Larcombe is remembered on Panel 3, Vis-en-Artois Memorial, Pas de Calais, France, and his name is inscribed on the War Memorial in the Borough. The grocery at 153 Sherborne Road, on the corner of St Michael's Avenue, that was the Larcombe family home for generations. The Commonwealth War Graves Commission certificate in memory of Reginald Larcombe.